At the Paris Air Show in Le Bourget on June 21, 2017, the European Space Agency (ESA) announced Europe’s first innovation competition on space exploration, the “Space Exploration Masters”. The Luxembourg Ministry of the Economy and its SpaceResources.lu initiative feature a special prize in this competition, focused on ideas targeting the utilization of space resources. The “Space Exploration Masters” competition, launched by AZO on behalf of ESA, is looking for innovative business ideas in space exploration that provide major benefits for the global society and the economy. This international competition aims to identify the best technology transfer business successes, as well as to empower and foster business innovation around space exploration activities in low Earth orbit for the benefit of society and humankind. Applications to take part in the competition can be made until 8 September 2017 at www.space-exploration-masters.com. There are two prize categories, “Technology Transfer Success” and “New Business Innovation”. The Ministry of the Economy of Luxembourg hosts the “Luxembourg Prize” in the category “New Business Innovation”, alongside several other prices. 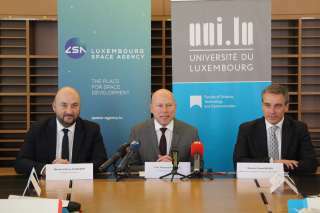 The “Luxembourg Prize” integrates perfectly into the SpaceResources.lu initiative, as it aims to discover innovative ideas and business cases complementing the Grand Duchy‘s growing portfolio of activities in space resources utilization. The challenge addresses companies, universities, scientific institutions, start-ups, and individuals willing to set-up a sustainable business and to create economic substance by establishing and registering a company in Luxembourg. The call for submissions covers the full value chain of space resources of prospection, extraction, processing, utilization, and distribution. The proposals submitted by the participants will be assessed by an interdisciplinary jury. The proposals should offer a long-term vision for space resources utilization, but also be able to generate an economic return in the short and medium-term, by using their solution in existing space and terrestrial markets. The winners will be announced at the NewSpace Europe conference hosted by Luxembourg on November 16 and 17, 2017. The Grand Duchy offers two awards within the frame of the “Luxembourg Prize”. The first one is designed to support for up to 400.000 euros a study under the Luxembourg national space program that is managed by ESA. The other award is intended for projects that are ready for early-stage funding. This award will offer a crowd investing campaign on www.spacestarters.com with a 30.000 euros value of services to prepare the campaign for launch. The Luxembourg Ministry of the Economy will support both award winners by incubating their companies in one of Luxembourg’s incubators. On top of that, one of the two winners will be selected as the official winner of the “Luxembourg Prize” and will thus be eligible for the “Excellence in Space Exploration – derived Business Innovation” overall prize of the Space Exploration Masters’ “New Ideas for Business Innovation” competition category.